Your Place Hostel is located in a calm street in the city center. We are very close to many bars, restaurants and supermarkets and also close to the main commerce street. We offer a nice free breakfast and free wi-fi. You can use our guest kitchen or read a book at our book exchange library. Have a free delicious breakfast before you leave to see the falls and other parks. The evening is time to Drink and Chill! There's always some free drinks on the kitchen table. If you have to cancel your booking, please do it at least 48hrs before arrival. 1. We have a garage for only 2 cars. Please book a garage in advance. 2. 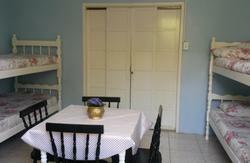 As this is a hostel, if you book a single, twin, double or triple you will probably find some spare beds in your room. Take the bus 'Jardim das Flores' (#115) and go off at McDonalds stop in Av. Jorge Schimmelpfeng**. It will take about 20 minutes, probably more. (now see item4). Take the bus 'TTU Centro' (#120) and go off at McDonalds stop in Av. Jorge Schimmelpfeng** It will take about 20 minutes, probably more. (now see item 4). Turn left in R. Mal. Floriano (opposite side of McDonalds, between a gas station 'BR' and Rafain Bar). Walk 4 blocks in R. Marechal Floriano and turn right on R. Joaquim Firmino. In this same block you will see the hostel, a pink house #222. - Da Av Jorge Schimmelpfeng, entrar na R. Marechal Floriano (entre o Rafain Bar e o Posto BR). Andar 4 quadras e virar a direita na R. Joaquim Firmino. Encontrar casa rosa 222.